What is a River Sojourn? 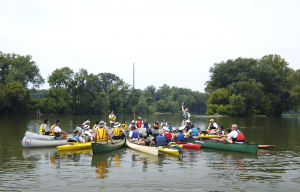 A River Sojourn is an organized float trip on a waterway with stops for environmental and educational programs, official ceremonies and dedications, community and environmental restoration events, meals, camping, games and fun! Each sojourn event can be as unique an experience as the stream it is paddled on and the individuals participating in it. Floats are usually two to eight days in length. 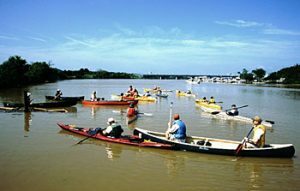 They can have from a few dozen to over 100 participants and take place on water bodies ranging from small streams to mile-wide rivers. Why Should I Plan a River Sojourn? Through paddling in, reading about, or meeting with a river sojourn, the public understands the need for stewardship, restoration, and conservation of your river’s resources. 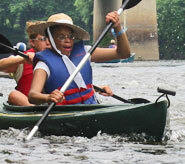 The participants especially develop a bond and sense of stewardship with the river. 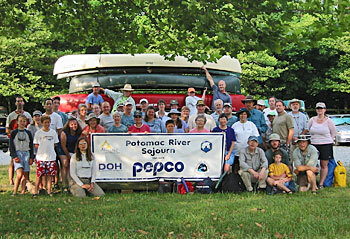 An annual sojourn can be a tool to recruit and train watershed residents to be watershed stewards. Enhancing community involvement in river corridor restoration. To get an idea of the expenses and difficulties in planning your river sojourn, imagine that you are planning a wedding. Now multiply the effort (and sometimes money) that goes into planning a wedding by the number of days you plan on holding your sojourn. Now you have a rough idea of what to expect. But just as there are many types of weddings (depending on your budget) there are also many types of river sojourns. You may be putting on a sojourn as a retreat for your board and staff, or as a public outreach and education event open to the public. You may want to travel a specific portion of your river or stream—one with particularly high scenic value or you may want to travel the river’s length to get to know the whole water body. During the voyage you may be interested in training participants in methods of protecting water quality, you may be trying to identify areas to target for restoration work, or you might just be out on the river for fun. Whatever the case, you will want to write out your specific goals and let them guide your work plan. Keep in mind that your goals and your audience will certainly affect the cost and effort that go into planning the voyage. As we stated above, there are many varieties of sojourns—from a two-day float trip with the board of your organization to an eight-day voyage with an average of over 100 participants each day. Obviously your budget is going to be very different depending on the type of trip you are putting together. Below we have outlined two sample sojourns—both lasting one week and averaging 50 participants a day. The high-end trip spares no expense for the participants, while the budget sojourn attempts to cut costs. The major ways of financing a river sojourn are through charging participants a fee for each day that they are on the river and through seeking out sponsors to either donate goods and services or to provide a cash contribution to the voyage. The vast majority of sojourns are paid for using some combination of the two methods. If possible, try to have some scholarship or reduced fee option so that you are able to offer the sojourn experience to all audiences, not just those that can afford it. The amount of time planning a sojourn varies greatly depending on the goals you have set. For example, planning for a weeklong sojourn with a large number of participants should begin about a year before the sojourn takes place. On the other hand, a two-day trip for a group of twenty may only take about a week to plan. Below is a sample of the steps that go into planning a generic sojourn float trip. Some of the steps may be unnecessary or skipped depending on your particular needs. Begin planning for next year’s event! It should be noted that several of these steps must be taken simultaneously. It is crucial to have an efficient and dedicated planning team that is in constant communication to make sure the work gets done! An in-depth manual made possible by Pennsylvania Organization for Watersheds and Rivers, National Park Service, and Pennsylvania Department of Conservation and Natural Resources is a great guide with several resources for those endeavoring to plan a sojourn.